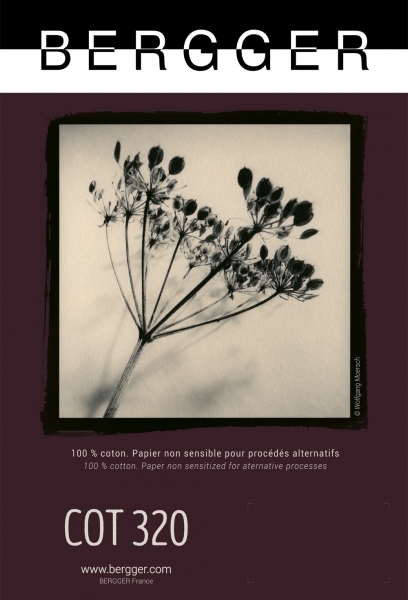 Bergger Cot 320 is an art paper, made in France, designed for alternative printing techniques.This uncoated paper is made of 100% cotton. Originally designed as the fiber base for Bergger's highly acclaimed “Silver Supreme” paper, this uncoated version is extremely high-quality. It has a base weight of 320 gsm and is especially suitable for darkroom processes. The excellent sizing of the paper makes hand coating easy and consistent. This paper is characterized by the different surface structures on the front and back. Both sides are excellent for coating. Bergger Cot 320 has a bright white surface with just a touch of warmth. In addition to platinum and palladium printing, this paper is also perfect for cyanotype, Ziatype, Van Dyke, Kallitype and flexographic printing.